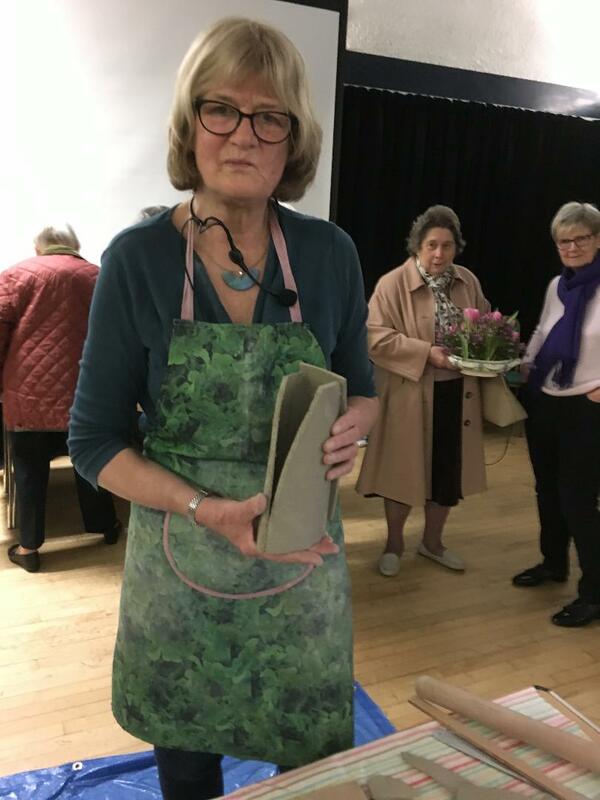 The guest speaker at our January meeting was ceramicist and artist, Tessa Wolfe Murray who lives and works in Hove and is a celebrated member of the Sussex Guild and Craft Potters Association. She makes sculptural and functional ceramics ‘pot plaques and jewellery using an age old method of hand-building with clay (slab work). 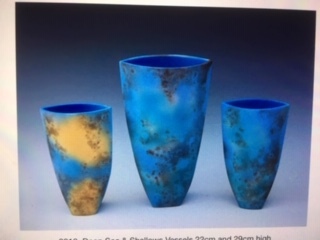 Tessa graduated from Ravensbourne College of Art with a Fine Arts Degree, followed by a post-graduate diploma in ceramics from Goldsmith’s College. 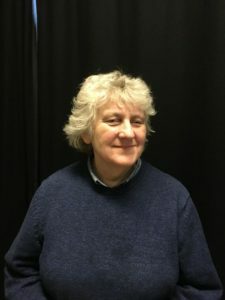 Her talk provided an interesting insight into her world and looking back over the early years Tessa told us how, as a young ceramicist, luck and opportunity led her down various career paths up to the present day. After leaving college her work was spotted by a buyer for Conran. Impressed with her designs she was asked to make slab pots for sale in their shops and having set up a small studio initially made each piece individually. However demand dictated that she find a mould maker and the pots sold in Conran shops across the world and individual pieces were found in galleries far and wide. She told us how she developed her skills by sharing a studio and working part-time for Anna Lambert who worked with white clay which meant moving to Yorkshire. However more opportunities followed when she established a small studio in Leeds and continued to enhance her reputation as a ceramicist and teacher. Tessa has that natural ability to look at the ordinary with an artist’s eye and she cited many occasions when she would see patterns, textures and colours in crumbling or derelict buildings and decaying city landscapes. When on a walk or on holiday abroad she would use her camera to great effect taking photographs which she would pin on the studio walls for future inspiration. She then explained and showed her method of ‘smoke firing’, which she experimented with over time as she needed all her pieces to be both waterproof and functional. This is done in the open where pots are laid in a fireproof bin, surrounded by damp sawdust. She then rubs sawdust on the pot and sets fire to it. The colours and patterns which emerge give the pots their unique look. Tessa has become known for her unique smoke fired pieces and samples of her work are displayed at craft and fine art galleries in the UK and Europe. After her talk Tessa set up a table and demonstrated the art of slab building showing us the simple and inventive tools used for cutting and shaping a vase. It was a treat for us to watch Tessa in action and was a fitting end to a most enjoyable morning which finished with a question and answer session and a sight of some examples of her current studio pieces. This entry was posted in Uncategorized on 17/02/2019 by HHCG Admin. Who knew that clay pipes could be so interesting? Well, when the lecture is given by Jacqui Pearce (a specialist in medieval pottery and clay pipes at the Museum of London) the subject proved to be both interesting and extremely entertaining. Entitled ‘The Archaeology of Smoking’ we enjoyed a journey through the history of tobacco from Sir Walter Raleigh introducing the leaf to Elisabeth I to the demise of the clay pipe in the trenches of the first world war, as cigarettes were deemed more convenient. Because clay pipes were cheap to manufacture but fragile, vast numbers of broken pipes have been found, lots in the mud banks of the Thames, and many of the fine illustrations were from the collection at the Museum of London. It is assumed that the smoking of tobacco in pipes was initiated by the first settlers in the “new world” being introduced to the habit by local Indians and the habit brought back by sailors and other travellers. Initially smoking was an expensive hobby given the difficulties and cost of bringing tobacco across the Atlantic and was restricted to the extremely wealthy. Indeed it is documented that people paid to watch others smoking. However not everybody was a fan and in 1604 James I wrote a pamphlet entitled “A counterblast to Smoking” as he hated the smell. Nevertheless he did enjoy the revenue and the settlement at Jamestown became a hub of export. In amongst the many illustrations was a pipe with the face of Sir Walter Raleigh carved on the bowl and also one made by Robert Cotton a pipe maker based in Jamestown but found in the Thames, presumably broken and discarded from a returning ship. Over the last 400 years the shape of the bowls has changed as has the diameter of the bores, making the dating broken pipes a great deal easier. The manufacture of clay pipes became a growth industry as the development of moulds made it easy to shape the clay and inset makers names, owners names and even elaborate designs on the bowls and a great deal of effort was made to decorate pipes to charge more and differentiate product from the cheap, plain, versions. By the late 18th century milling and burnishing was common and some even added red wax to the tip of the stem to improve the feeling for the lips. The Dutch and Germans were particularly keen on lavish decoration and as tobacco became cheaper the bowls increased in size, leaving more space for decoration. Indeed it became common for pipes to be used to commemorate famous events and we were shown one celebrating the victory of the Duke of Cumberland at Culloden in 1746 with carving similar to the decoration on porcelain plates and other wares of the time. It also became popular for Livery Companies, Masonic Lodges and even Military Regiments to have badged pipes for members replicating the decoration on the formal dinner services etc. It subsequently became popular for coffee shops and public houses to sell badged pipes. We were also shown pipes with carvings of sporting themes, the heads of famous people of the time including William Gladstone, and also how black clay was used to add novelty and presumably value. Maybe the most extraordinary example of these is dated to 1878 and shows a judge carved on the bowl with the jury sitting on the stem. Maybe to mark a notorious trial? Jacqui also showed examples of ‘novelty’ pipes with multiple bowls, twisted stems and even pipes that were given away with comics, but of particular interest were the examples of beautifully decorated ceramic pipes produced by the major porcelain manufacturers of northern Europe, including Meissen. The lecture concluded with a selection of paintings and photographs showing how smoking and the clay pipes used became a part of everyday life, initially for the extremely rich as they posed for portraits but gradually for everybody. This entry was posted in Uncategorized on 06/01/2019 by HHCG Admin.